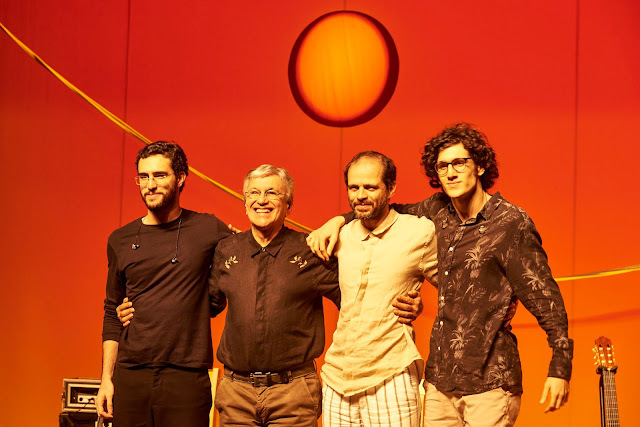 Singer and songwriter Moreno Veloso has collaborated with renowned Brazilian musicians, among them Gilberto Gil in Gil’s recent show Refavela 40. At age nine, Moreno wrote his first composition with his father, "Um canto de afoxé para o bloco do Ilê," recorded by Caetano on “Cores, Nomes" (1982). Zeca Veloso, meanwhile, experimented with electronic music before writing on his own. Zeca, the middle son, had success with his song "Todo Homem," the theme of the Brazilian TV series “Onde Nascem os Fortes" (Rede Globo, 2018). The Ofertório tour is Zeca’s debut on stage with his family; they perform some of his compositions. Tom Veloso, the youngest, is no longer asking his father to stop. He is a composer and guitarist in the band Dônica, recording its second album. He is named after the great musician Tom Jobim; born on the same date. In Ofertório, Tom presents his compositions/collaborations, including “Um Só Lugar," made famous by singer Roberta Sá. Ofertório will be at BAM Apr 12 & 13.